TCP has been a player in the energy-efficient lighting market for more than 20 years, and it’s put its hat in the smart home ring with its line of Connected light bulbs. The brightness of the bulbs is 800 lumens, which is about as bright as a standard 60-watt bulb. The Connected bulbs are among the brightest of those discussed so far in this chapter. 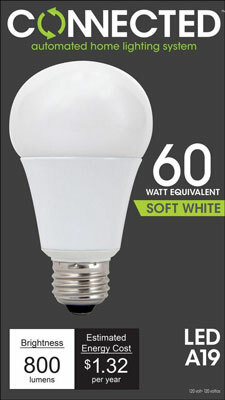 These bulbs are also smart, communicating with the Connect Lighting Gateway so that you can control them from anywhere in your home (or out of it, as you see in a bit). The bulbs come in two sizes: A19 to fit standard bulb sockets, and BR30 for recessed lighting. Both sizes come in either soft white or daylight, and you can mix the two if you like. Credit: Image courtesy of TCP International Holdings, Ltd. Turn off power to the light sockets at the wall switch. Replace your existing bulbs with new Connected bulbs. Turn the wall light switches back on. Hook the Lighting Gateway to your Wi-Fi router using the supplied Ethernet cable and the power cable. Download the TCP Lighting app from the iOS or Android App Store. Walk through the on-screen instructions for setting up your Connected bulbs. The app will automatically discover the bulbs once you open it on your smart device. The TCP Connected bulbs are compatible with the Wink system. This means that if you already have the Wink hub, all you now need to purchase are individual TCP bulbs, as opposed to needing a starter kit. The Wink hub takes the place of TCP’s Lighting Gateway, and the Wink app can handle the remote control of your lights on both iOS and Android devices.